Peter J. Mallott QPM. Cert. Ed. Intelligence Analysis Training Ltd is based in the UK. Our law enforcement analyst training is delivered by Intelligence Analysis instructors, who are recently retired law enforcement personnel, with experience of serious and serial crime investigation. They possess nationally recognised training qualifications (UK) and they have been directly involved in Intelligence and Analysis for the last 15 years or so – either as practitioners, trainers or both. Our trainers have recently designed and delivered a wide variety of successful classroom based crime & intelligence analysis training, communications data analysis training and courtroom training to law enforcement analysts and other sworn personnel in the UK and several other countries around the world, as well as online crime analysis training. They have also delivered law enforcement analyst training in Romania, Lithuania, Libya and Bulgaria on behalf of The United Nations Drug Control Programmes (UNDCP), Bespoke Intelligence Analysis, Communications Analysis and Xanalys training on behalf of the Belgian Development Agency (BTC), to The Rwanda National Police in Kigali Rwanda and Euro customs as well as analytical training in Bahrain and to Swedish Customs and Intelligence Development training to The Anti Corruption Commission in Kenya. They have also performed training needs analysis on behalf of several organisations including the UNDCP and ANGA in Libya. All our instructors are members of the IACA (International Association of Crime Analysts) and the IALEIA (International Association of Law Enforcement Intelligence Analysts). They are experienced trainers and have delivered regular classroom based courses in the UK. Our Consultant Trainers have various backgrounds in Law Enforcement, Operational Management and with the design and application of Law Enforcement Products. We hold full Professional Indemnity & Public Liability insurance policies. 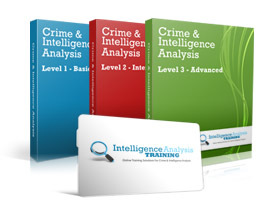 Here at Intelligence Analysis Training Ltd we want to help you to be competitive in today’s career environment, that’s why we provide you with courses that are designed to be relevant, interesting, easy to absorb and value for money. Our Online Courses are recognised by the IALEIA Professional Certification Committee towards recertification with their Professional Certification Program. Try one of our online courses now, totally free! Take advantage of this free offer now, try before you buy. Get your free course and our free newsletter by signing up above.